Photo 6. This panorama of the Clwydian Range is split into two, with the northern end of the range shown here, and the southern end shown in Photo 7, below. The range is an uplifted ‘horst block’ produced by east-west extension. It is mainly composed of distal Silurian turbidites, the Elwy and Nantglyn Flags Formations. It is separated from the Denbigh Moors to the west by the extensionally down-faulted, half-graben of the Clwyd Valley (in the foreground) which is filled with younger Carboniferous and Permo-Triassic rocks. Photo 7. The southern part of the Clwydian Range shows the strikingly ‘notched’ nature of the long summit crest of the range, with several distinct summit ‘blocks’ separated by steep, short side valleys and intervening, cross-cutting cols. These steep side valleys and cols are formed by a series of east-west ‘cross-faults’ which divide the long, almost north-south oriented range into smaller blocks. These faults suggest that the range has undergone extension in a north-south as well as an east west direction. Photo 8. These strikingly shaped beds of the Nantglyn Flags Formation outcrop in a road cutting on the west side of the Bwlch Clwyd Pass, on the A494 Ruthin to Mold road. 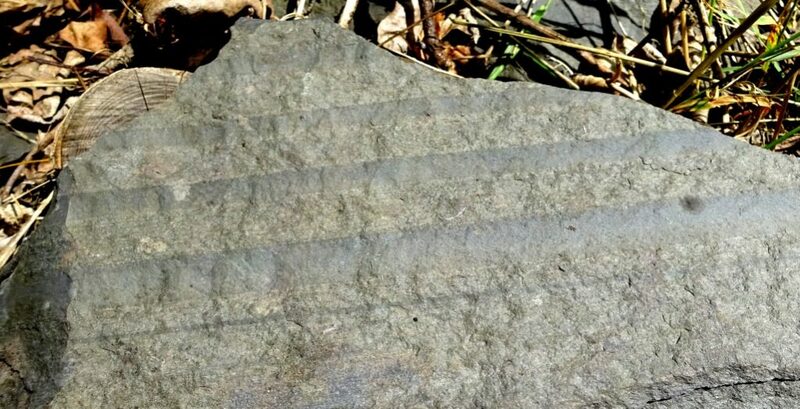 These relatively thin-bedded rocks are distal, predominantly finer grained turbidites than those seen further west in the Denbigh Moors and Conwy valley areas, as they are more distant from their mainly western source areas. Photo 9. Close up view of the Nantglyn Flags Formation fine grained turbidites seen in Photo 8. The rocks can be seen to consist of thinly interbedded, fining up units of lighter coloured silt/fine sand, and darker silty mudstone.